Can dandruff and home remedies relate to a problem and solution respectively? The sound answer is Yes! 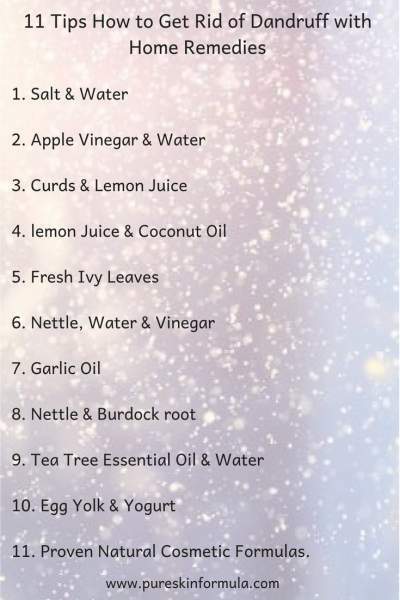 Read the next lines, to understand how to get rid of dandruff with home remedies! By the way, did you know how deep the dandruff issue is? Let me tell you the numbers. If we take the US, about 50 million Americans suffer dandruff. As a percentage, it is around 18%, and it is similar in Europe and other parts of the world. 2. What is the reason for dandruff? 3. What types of dandruff may we experience? 2. Why do I have so much dandruff? Can stress cause dandruff? 3. How to cure dandruff naturally? Simply put, dandruff is when the skin of your scalp peels off more than usual! In the course of time, the old cells die and are replaced by new ones. Each person goes through this process. The cells change in 25-30 days, but not simultaneously. That’s why we don’t pay attention to this process. If our immune system weakens, it reflects our skin, which starts inflaming, itching, and breaks the average cell life cycle. This cycle may speed up – let’s say the cell renovation happens for 10-18 days. The new cells appear very quickly and pile up on the current cells. When there are too many replaced cells in parallel, dandruff is here! We can see it when those smaller and bigger skin flakes start falling from our head. An unpleasant intense itch sometimes accompanies the process. In its severe form, dandruff might turn into seborrhea. There are varied reasons, both internal and external, that cause dandruff. Let’s see some of them. Lower than usual secretion of sebaceous glands, which are the oil-secreting tissue in the skin. Improper usage of cosmetic and hygienic products, and utilization of low-quality cosmetic and sanitary products. What does not cause dandruff? 1. It is not lack of hygiene that leads to dandruff. You already know it is instead a genetic issue or a matter of stress. As for hygiene, it is just the opposite! Dandruff could appear not because of lack of skin care and hair care, but due to a very frequent hair washing and treating it with the wrong stuff. For example – hair sprays and gels could harm our scalp condition. 2. It does not depend on the season. Seasonality is not a factor, causing dandruff. If you have it and don’t cure it, it will torture you every season possible. Still, climate conditions can make a difference regarding how bad is the situation. 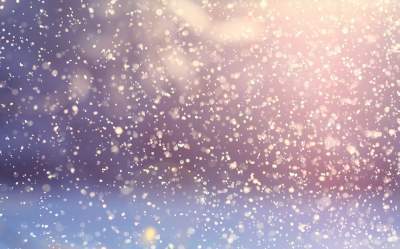 High humidity could stimulate flakes’ production, though if you are on the beach, the combination between the sun (while avoiding it in the mid part of the day) and salty air, could improve your condition. In the winter, we naturally tend to live mostly in heated premises. This could stimulate drying our scalp. One of the classic solutions to opposing dry condition is drinking enough water (at least 1.5 liters/50 fl oz. a day). Before we go through some dandruff home remedies, let’s check what types of dandruff we may experience. 1. 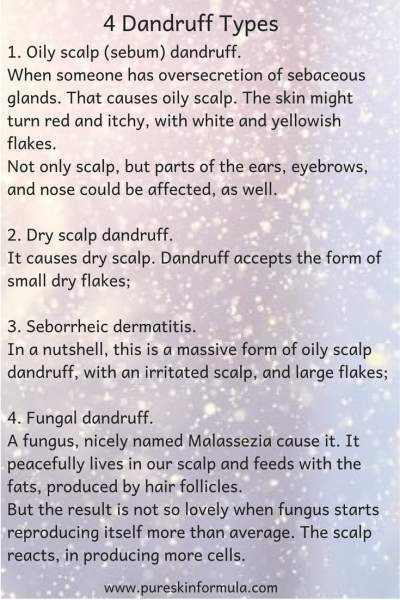 Oily scalp (sebum) dandruff. This is when someone has oversecretion of sebaceous glands, resulting in the oily scalp. The skin might turn red and itchy, with white and yellowish flakes. Not only scalp, but parts of the ears, eyebrows, and nose could be affected, as well. 2. Dry scalp dandruff. It causes dry scalp. Dandruff accepts the form of small dry flakes. 3. Seborrheic dermatitis. In a nutshell, this is a massive form of oily scalp dandruff, with an irritated scalp, and large flakes. 4. Fungal dandruff. A fungus, nicely named Malassezia causes it. It peacefully lives in our scalp and feeds with the fats, produced by hair follicles. But the result is not so lovely when fungus starts reproducing itself more than average. The scalp reacts, in producing more cells. You know the outcome! Okay. When we have defined the problem, let’s see what you can do to fix it with homemade solutions. How to stop dandruff naturally? Below you will find tips, which you can easily and quickly follow, as they include home remedies. Take a handful of salt, and dissolve in 1 liter (34 fl oz) water. Rinse your hair with the solution after taking a shower. Don’t wash your hair after that, and leave it until it gets dry. This should relieve your dandruff condition. Vinegar is an excellent option for balancing your pH level, washing the buildups away and treating dandruff symptoms. Mix 2 tablespoons apple vinegar with 3 water cups water. Apply to your scalp and hair. Leave it through the night, and rinse in the morning with shampoo. It will make your hair healthy and shiny. Another version of the recipe is to use pure vinegar. Wet your hair, and rinse it with apple vinegar, before washing it with shampoo. Mix 2 tablespoons curds with 5 drops lemon juice. Apply to the scalp for 20 minutes, and wash with shampoo. It should have an anti-dandruff effect and soothe the scalp. Mix the juice of 1 lemon with coconut oil, with respective ratio 3:1. Apply to the scalp, and leave it as long as possible – ideally through the night. In the morning wash with shampoo. Take fresh ivy leaves, and chop them up. Boil 1 tablespoon ivy in 500 ml (17 fl oz) water for 10 minutes. Filter the tea and in the next 30 days, before you go to bed, comb your hair with a brush, dipped into the brew. Boil 100 gr (3.5 oz) chopped nettle leaves for 30 minutes in a mixture of 500 ml (17 fl oz) water, and 500 ml (17 fl oz) vinegar. Filter the liquid and wash your hair every day in the next 2 weeks. Scalp massage with garlic oil is appropriate for seborrheic dermatitis. Gently rub garlic oil on the hair roots. Leave it for 2 hours, and wash with shampoo. Mix 3 tablespoons chopped nettle and 3 tablespoons burdock root. Boil it in 400 ml (13.5 fl oz), and for 30 minutes. Filter the liquid, and massage your scalp 2-3 times a week. Tea tree essential oil is antibacterial, anti-inflammatory, antifungal, and antiseptic. Mix well 1 tablespoon tea tree oil with 1 teacup water. When you wash your hair, massage the roots. Leave it for a few minutes, and rinse. Mix 1 egg yolk with 1 teacup yogurt (better be close to expiration). Massage your scalp, and leave it for 10-15 minutes. It has both anti-dandruff and nourishing effect. You can add 1 teaspoon olive oil if you have dry scalp dandruff. This tip is not about homemade, but (still) a natural remedy. While using some of the above solutions, you can always enhance your anti-dandruff hair cair with proven natural cosmetic formulas. There are fantastic hair masks and shampoos, which will complete your “toolkit.” Thus you will be calm you are on the safe side, regarding fighting dandruff and all other scalp and hair issues, you might have. Now you know a ton about how to get rid of dandruff with home remedies. Your next step? And one last piece of advice – even if your hair is in good shape, don’t wait until dandruff (or whatever) appears, to react. Treat your skin and hair properly all the time, and you will like the result. I would love to hear from you! How do you (plan to) prevent your hair from dandruff? Leave me a comment and I will answer you! Wow, this is very useful info. However, I think the dandruff comes from what brand of shampoo you use. Your remedies are OK but their smell are not good :). When you get dandruff, just try to change other brand of shampoo until you found the most suite for your skin and eliminates the dandruff completely. Thank you for your comment, Mong Phan! Fully agree with you about shampoos and other hygienic products. If they are crappy, or not appropriate, they could damage your hair and lead to dandruff, as well. 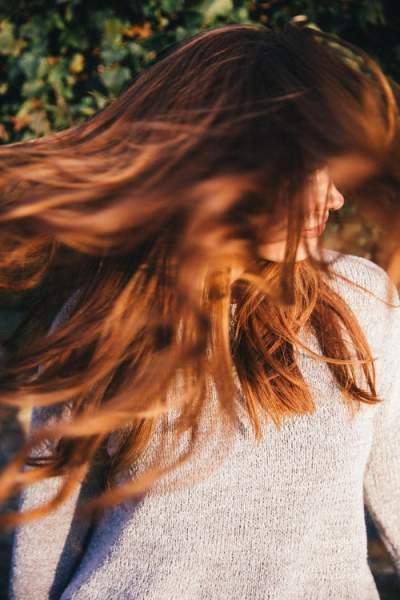 As for the smell – it is a subjective sensation:) But even if some of the homemade remedies does not smell good, if they help, one may disregard this downside for getting the big thing – healthy and shiny hair. I’ve never had dandruff, but I think most of the time, it is due to either lack of water or lack of nutrients that the skin needs. Keeping well hydrated is probably going to cure the problem for most people. Taking these other supplements or foods should be the next step in healing dandruff. Thank you for your advice, Melinda! Agree with you enough water and the right nutrition are among the important anti-dandruff solutions!